Ok, so I admit I’m not entirely up to date on my X-Men storylines. I am not completely out of the loop though, I was well aware that Cyclops killed Professor Xavier in an issue of the recent Avengers vs. X-men series, despite not having actively read it. However, much of my X-Men love comes from the adoration of the 1990’s animated series that aired on Fox. If you have never seen it, episodes are available on DVD. “WELCOME TO THE JEAN GREY SCHOOL OF HIGHER LEARNING! The ALL NEW MARVEL NOW smash hit series schools with Jason Latour (WINTER SOLDIER) and Mahmud Asrar (X-MEN) leading the charge with drama, action and homework(?)! World-famous X-Men Wolverine, Storm, and a star-studded faculty must educate the next generation all-powerful, but inexperienced mutants! But with their own lives steeped in deadly enemies and personal crises, how can the X-Men guide and educate–let alone defend–the school? At the Jean Grey School, you never know who will enroll…or who will lead the class! And what mysterious organization waits in the shadows to destroy Wolverine’s mutant sanctuary? I mean, what’s not to love about that? The actual book however was a different story. A lot is going on, unfortunately, without being versed in all that happened in Wolverine and The X-men, (before the relaunch) I did feel a little overwhelmed/lost. 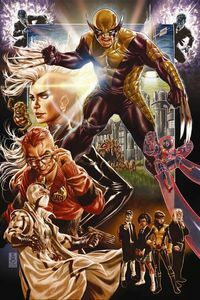 Right now, Storm is the only “senior” member at the school, as Wolverine, who has also taken off for some reason or other, has granted the rest of the “Star-studded Faculty” extended personal leave. We are left with student teachers to run classes and such. Basically everything is a big old mess. It wasn’t a bad issue by any means, in fact, I’ve seen plenty of people raving about it. However, if you’re new(ish) to the world of X-Men, or at least the current comic book world of X-Men, you may want to do some research/check out the original title before diving in. Personally, I’m not sure if I’ll be grabbing Issue 2. Got any thoughts/opinions on Wolverine and the X-Men #1 to share? Hit up the comments and let us know what you think. This entry was posted in Comics and tagged Comic Books, Comics, Marvel, Reviews, Wolverine, Wolverine and the X-Men, X-Men. Bookmark the permalink. ← Episode 26: This Week In Geek: New, News and Rumors! Thanks for your comment. You’re right is is hard to jump back into a storyline that is already established, and I probably shouldn’t give up on WatX just yet. I was just a little saddened by the fact that Issue #1 left me not as intrigued for Issue #2 as I would have liked. Here’s hoping things pick up in the next issue.